Alicia joined as a coordinator of the Sustainable Finance Initiative at RS Group Asia in 2017. Alicia is Founder of Women in Sports Empowered Hong Kong (“WISE HK”), a sports-focused initiative that champions sports for women and girls in Hong Kong. Prior to this Alicia was a Project Manager at The Global Development Incubator, Manager at Accenture and Analyst at JPMorgan Chase. Alicia holds an Executive Masters in Public Administration from NYU-UCL, MBA from INSEAD and a BA in Economics from the University of Chicago. 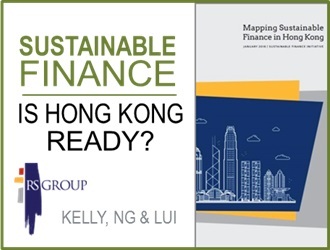 Sustainable Finance – Hong Kong Is Ready!